Thurstan commenced playing cricket in 1953 when the first eleven comprising many under 16ners were pitted against the 2nd IX of leading Colombo Schools. Thurstan was fortunate that it’s first Principal Mr. Earle Schokman was an ardent cricket fan and gave what ever assistance to uplift the game at Thurstan. His passion for the game even extended to giving the latest cricket updates on test matches played in Australia over the public address system. By early sixties Thurstan were playing first eleven cricket against all leading Colombo schools. In the early sixties when the Nationalized Schools Cricket Association [ NSCA] toured Australia, 4 Thurstanites went on three of these tours. 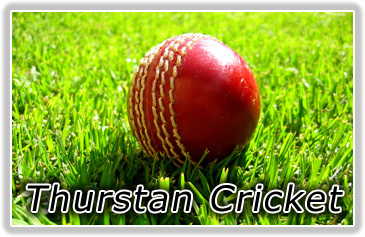 Thurstan play 1st XI cricket with all leading schools in Colombo & Outstation except Ananda. Thurstan Won the Lemonade trophy six-a-side tournament organized by Wesley College in 1995. Thurstan has over the years has produced a number of cricketers who shone at School level but only a few went on to play at National level. Ceylon against England in 1973 in an UNOFFICIAL TEST. This was followed after more than 2 decades when Niroshan Bandaratilleke played against New Zealand in 1999. Hemantha Boteju who captained College in 1995 at the age of 17 years showed as an outstanding all rounder in his 5 year career as a Schoolboy, perhaps the best ever all rounder produced by Thurstan had the honour of representing Sri Lanka in an ONE DAY INTERNATIONAL against India & Pakistan. Perhaps the best Cricketer in the 50's was the late Shunith Goonetilleke a stylish wicket Keeper batsman who later played for the University and he was the " walking Wisden " and Upali Ahangama who captained College in 1960 will come close to him as an authority on Sri Lanka Cricket . Upali had the honour of coaching his alma mater for nearly 25 years with a break in the late 70's when he attended the Alf Gower School of coaching in England. He also was the acting Secretary of the Board of Control for Cricket when Sri Lanka won the World Cup in 1996. Undoubtedly the Best Batsman produced by Thurstan was the late Diyanesh Rajaratnam who played for College between 1968-72. He was the nemesis of many a schoolboy bowlers and perhaps the highlight of his career was the blistering knock of 204 Not Out against a much fancied Prince of Wales attack in 1971. Coming close is the unbeaten knock of 68 in 55 min against Isipathana in 1972 which almost snatched victory for Thurstan when Isipathana asked Thurstan to chase 111 runs for victory in 60 minutes and they ended up at 104 for 1 when a crowd invasion deprived Thurstan of a certain victory. He was also the first Thurstanite to tour with the Sri Lanka Schools team when he went to India in late 1969. This tour had many schoolboys who later donned the Sri Lanka Cap, but Diyanesh did not have this honour though he scored many runs in Sara Trophy cricket. Diyanesh represented Board Presidents against Hongkong and Malaysia., Sri Lanka trialist and was shadow keeper to Russel Harmer. A team mate of Diyanesh at College, Saliya Wijewardana went on to become a deadly medium pacer at Sara level and bagged many wickets in the 70's but could not achieve National honours. Saman Akarwita who was a fine exponent of the Chinaman was the next Thurstanite to tour with the Sri Lanka Schools when he tour England in 1975. Jayalath Aponso [ 1970-71 ] Captained Nomads for nearly 10 years in the 80's-90's.